HEXUS first took a long hard look at the NZXT S340 back in January 2015, with a thorough review of this affordable mid-tower chassis. We considered it to be an excellent choice and practically a 'no-brainer' for a low-cost gaming rig, with the only negative points being its lack of a reset button and the ease with which the finish could be scuffed, if not careful. Since that time NZXT has revisited the Source 340, to give it its unabbreviated name, first with the Special Edition S340 in August 2015, and then with the special Razer Edition back in October 2015. A year later here we are again with a new NZXT S340, this time it’s the S340 Elite, which expands on the chassis durability and usability (extra I/O), adds VR niceties, and more. 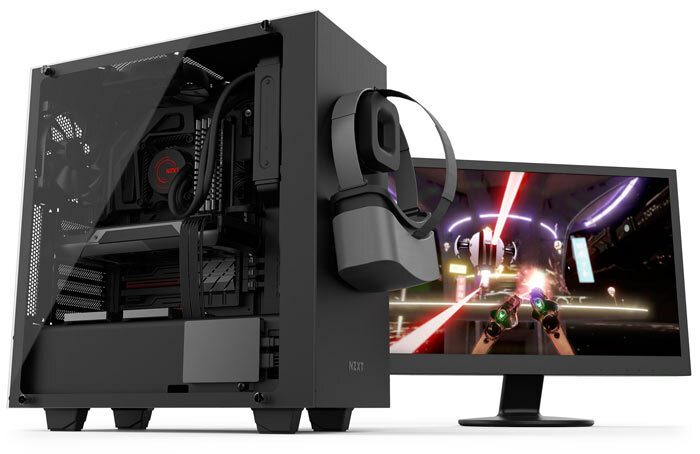 NZXT is calling the S340 Elite "the most refined and elegant S340" so far. Talking about the new NZXT S340 Elite, Johnny Hou, NZXT’s founder and CEO, said "We’ve always championed the idea that building truly beautiful PC’s should be easy for anyone and the S340 Elite makes this even simpler." 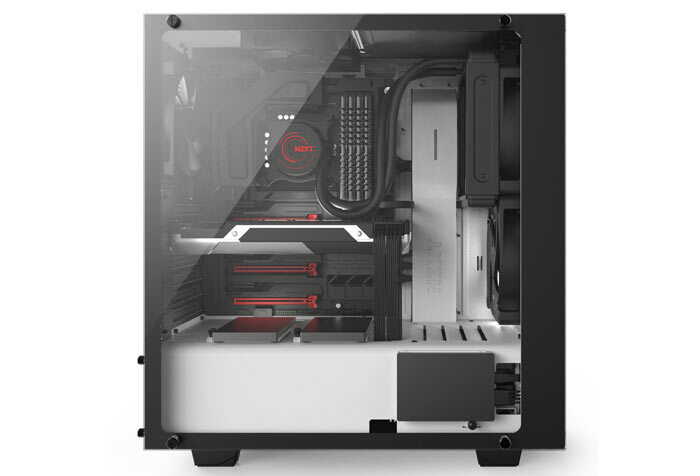 Add to that some neat design touches such as a large 4mm tempered-glass side-panel to showcase your build, and this could be a winning design. Inside you will find an open-interior design with a steel cable management bar that splits the front intake from the rest of the case. New to the Elite is a clamping system added behind the cable management bar and along the rear. This helps you make as clean a build as possible to show off your choice components through the clear tempered glass side. Quite a few design considerations have been tweaked for the VR HMD user. NZXT has made the commonly required HDMI and USB-port connectivity readily available from the top panel. A specially designed magnetic cable management puck keeps CR and audio cables tidy too. 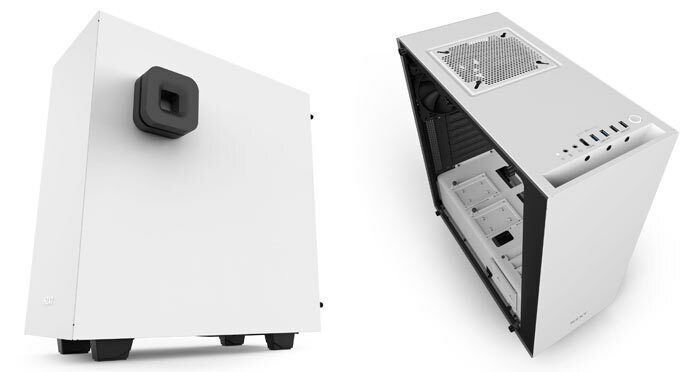 For enthusiasts it's good to hear that NZXT has all considered all corners of the chassis. The S340 Elite features fully-filtered intakes, steel-plated audio jacks, captive thumb screws, cable management solutions, and more within its compact dimensions. Furthermore, the chassis is fully compatible with NZXT’s entire line of Kraken Series liquid coolers. please glance at the following table. NZXT says the S340 Elite is available immediately in Matte White , Matte Black, Matte Black + Red. UK pricing has been set at £89.99 inc VAT. Provides 5 USB 2.0 ports: 3 internal and 2 external connectors. Magnetic body quickly affixes to any metallic surface. Molex connection provides additional power via PC’s power supply. 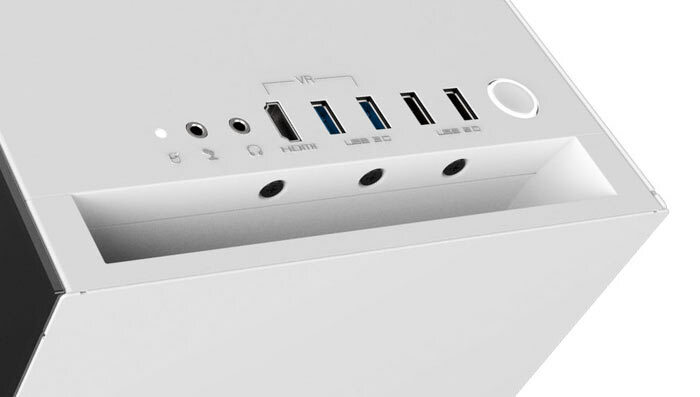 NZXT has put an RRP of £17.99 inc VAT on this hub, also said to be available immediately. I'm simply not a fan of putting a big solid wall in front of your vents - it looks swish, but it's never going to be great cooling performance. Still, I guess I'm not the target audience as I use external slots on the front of my computer. Fractal Design has the right idea with the Define series, instead of putting the vent openings on the top and bottom, the venting goes along the sides so there's plenty of space for air to get pulled in by the fans and no chance of air choking around the middle where a fan might be in, say, the Define S. And the R5 is there if you still need space for optical drives and such. I had the S340 and the cooling performance is actually great and makes it a bit quieter too. As I have every single case and CPU fan on less than 1000 RPM I can easily get enough air through the available vents. Moving to a compact SFX case I truly miss the cooling performance of the S340. Maybe I'm just too used to the cooling constraint of small ITX and SFX builds so the S340 seemed to offer great cooling performance to me. Exactly why I bought the Define S a few months back instead of S340. The cooling is excellent with the side front vents. The Define S is cheaper too. Has 2x140mm fans included instead of the 2x120mm in the S340. Then to top it off the Define S has some soundproofing material on all the case panels. Fantastic. No external 5 1/4 bay for a BD/DVD drive or the likes..